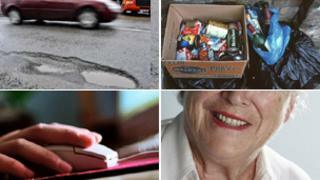 Dundee City Council has unveiled how it plans to save £14.5m from next year's budget. Among the SNP administration's proposals are a £4m cut in education and the transfer of the Caird Hall concert venue to a public trust. The council hopes to save more than £5m through voluntary redundancies, early retirements and a wage freeze. But council leaders said frontline services have escaped the majority of the cuts. An extra £2.2m would be spent on social work, with an additional £300,000 set aside for winter maintenance and £200,000 for residential places for children, the council said. Council leader Ken Guild said: "We have been taking a fresh look at how we can provide the best services for the people of Dundee within very tight financial constraints, while maintaining a council tax freeze. "That work has helped shape the savings proposals we as an administration are bringing forward today." The measures will need to be approved by councillors in February.